It shouldn’t be any surprise to you that I’m writing after 3AM once again. But why? Why not go to bed if there’s nothing else that you need to do? Perhaps I just feel like it, or perhaps I’m writing here so late at night/early in the morning because I need to. That could explain why I don’t chose sleep over voluntary writing; the writing is not voluntary, it is a necessity. What must I write that is so important that I absolutely need to lose thirty minutes of sleep over it? Well, it’s good news! Yes, good news that perhaps makes me a tad bit nervous, and a whole lot of excited. It’s such good news, that perhaps, I dare not go deeper into explaining it for fear that I jinx it. For what it’s worth, I’ll hint that a problem expressed in a recent edition of What’s Up? may finally be coming to an end. Oh I know, I’m being a tease right? There are some things I can tell you about though! I finally had a chance to hear Dr. Lisa Brush speak on something; that something being Women in the Workforce. A presence during Gender Sexuality & Women’s Studies programs, she’s always asked interesting questions – and last night she also proved to be an interesting speaker. I also ran into somebody who, perhaps I wish I hadn’t run into, because whenever I do – I think about inviting her to hang out, even when exiling her from my life would probably be easiest. Finally; in a screwed up world where I somehow have four simultaneous games of Pokemon in my life (Pokemon Silver, Twitch Plays Pokemon Emerald, Pokemon Black 2, and Pokemon Y), I’ve found the most joy in creating mono-type teams in Pokemon Y. The ability to access an easy-to-use Global Trade System, and the diverse Kalos region, has made assembling a Water-type team a few weeks ago, and a Fairy-type team yesterday fun, and as challenging as I want it to be. Sometimes I feel embarrassed about how relevant Pokemon is in my life, as somebody turning 21 soon; and somehow the words of somebody I don’t even like ring true in my head. He said something along the lines of, “not giving up something you love as a false gesture of your maturation,” and while again, I kind of hate this guy – he’s right in a way. The “mature” thing for me to do is accept and embrace that I’m going to be a 21 year old who loves Pokemon, as abandoning it just to prove I’m “all grown up” is actually the childish thing to do, and a mistake I wish I hadn’t made over ten years ago. I twirl the glass cork through my fingers, I toss it into the air, I catch it in the palm of my right hand, “14” it says. Cianwood City in Pokemon Silver established some precedent that carried over into Pokemon Emerald’s Dewford Town, which is to say that if you’re going to cross oceans to find a town full of sailors, there’s going to be a fighting-type gym there… for some reason. Panda needs to deliver a letter to a guy named Steven, but can’t without the badge from Dewford’s gym. I never realized how sweet Goldeen’s “Peck” was until now, I mean, it was kind of crazy to sweep a fighting type gym with a freaking Goldeen, you know? It’s not an incredible late-game attack to hold onto, but I’m really glad Goldeen knows a flying-type move, I’m not even mad that it doesn’t know any water-attacks yet. Not even mad! Getting the Knuckle Badge was a bit more difficult than spamming Goldeen’s attacks though; I also had to spam Crobat’s “Screech” to lower the insane defense of Brawly’s Makuhita. I like fighting-type Pokemon, and even though I’m not into the bigger meta-game, I like that in order to beat Brawly, I had to put in a Pokemon just to lower another’s defense, and I think part of that is thanks to the stat-boosting nature of fighting-type moves. I mean, all Pokemon have stat-boost moves available, but for fighting-type Pokemon, it’s like, mandatory. To conclude this log: the captured Pokemon from Dewford’s caves is Golbat, which means we’ll have a backup plan in case anything ever kills Crobat. On Route 102, Panda and Goldeen caught a Hoothoot. Looks like the ghosts of Nuzlockes past are back for a haunting. For those counting, this is catch #4. Route 102: Caught: Hoothoot. The team’s looking way one-sided, so I’m thinking Pichu’s up for a lot of training. And by training, I mean lots and lots of grinding out experience points. I love to stop and think of what’s happening in Pokemon very literally sometimes. A girl named Panda is fighting off blobs of toxic goo (Muk) and frightening poisonous bats (Crobats) with a tiny baby electric mouse (Pichu). She’s either, brave, stupid, or ruthless, and any way you spin it, you end up with one battle-hardened Pichu. In what feels like the blink of an eye, Pichu crawled from level 3, to level 8, putting him right up at Goldeen’s side. He learned Tail Whip (yay) and Thunder Wave (less sarcastic, yay). Magnemite’s training is going to be way more tedious, even when we’re fast-forwarding through all of it. Seriously, it only knows Tackle and some other worthless move. I think Magnemite’s worth it… eventually, but this is horrible work, raising him up. I’ve always had a soft spot for Magnemite though, I think because I love the sounds they make. At level 6, Magnemite learns Thundershock and that’s enough for me. It knows a pretty okay attack that isn’t Tackle, so we can move on from this painfully boring training. I’m going to waltz right into Petalburg without training Hoothoot; Panda won’t be needing him for a while, I reckon. Goldeen knows a flying-type move, and we’re heading towards a Rock-type gym in bad odds right now anyways. Three Pokemon who are weak to Rock? Bad luck Panda, bad luck. Route 104: This is where the horn music gets a little obnoxious. Still, I’ve played this game how many times? I know it, I’m used to it, and I kind of like it by now. I traditionally catch some really great Pokemon on Route 104. On my first randomizer play-through, I caught a Spheal that I took all the way to the Elite Four, and on the last Nuzlocke I caught a Spinirak that, while it never became a crucial part of the team, it certainly went places. Finding a wild encounter on Route 104 takes forever, but a Crobat finally shows up. Disappointed that it’s not a Pokemon I already haven’t encountered, but Crobats are pretty alright. I just don’t think it’s going to learn anything great, seeing how it’s a level 5 fully-evolved Pokemon. If the first Pokeball didn’t catch it, I wasn’t going to waste another – but as luck would have it, Panda caught the winged poison-bat native to her home town of Littleroot. Route 104: Caught: Crobat. Catching a Crobat is also incredibly disappointing, when the very next thing you encounter on Route 104 is a Shellder. Really? I could have had one of those things on my team instead? Bad luck Panda, bad luck. It’s hard to get into the mindset of Panda, this early on at least. If we’re getting meta, that is. I think it’s fun to think too much about Pokemon sometimes. Stay with me on this: but imagine if a girl named Panda was actually out there, fighting wild Pokemon, forcing owls to beat up shells, and electric mice to fight other rip-off electric mice. Panda is kind of a sociopath, not thinking, perhaps, these Pokemon don’t want to just fight, get healed, fight, and get healed some more. I like to think Panda actually likes Goldeen though; like when I battle with Goldeen it means something because she’s the starter Pokemon, but Hoothoot and Crobat? They’re extras. Heh. In the Petalburg Woods, we encounter a Nuzleaf. I mean, I have to catch that guy, his family is how we even got the name Nuzlocke, right? Magnemite takes a pounding, losing all of two health points, while Nuzleaf is paralyzed and tackled within an inch of his life. Petalburg Woods: Caught: Nuzleaf. That’s actually pretty exciting; I’ve never raised a Seedot before, so I’ve never played with a Nuzleaf. He’s dark and grass type, which isn’t bad, but he’s got no moves. Just give him a few hours with Panda, the psychopath physical trainer, and he’ll learn something. Here we are at the end of Log Two, and we’ve already got our first six Pokemon. At level 9: Goldeen. At level 8: Pichu and Magnemite. At level 6: Crobat. At level 5: Hoothoot and Nuzleaf. I’m not upset with these six, though they are certainly not the six that are going to make it all the way, if we’re lucky enough to make it all the way. Pichu, Crobat, and Hoothoot would never make it through the Rock-gym, and Magnemite is no good there unless it learns some steel-type moves. Goldeen and Nuzleaf will have to lead the pack here, and if they fail, things can get ugly. But before any of that can happen, Panda has to get out of the forest. 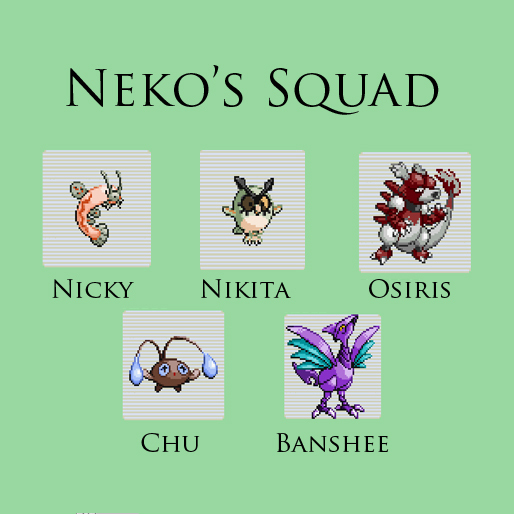 This is exactly how I’ve customized Pokemon Emerald for this Nuzlocke Challenge. The starters are random, but all basic Pokemon. I’ve done this because I’d like to have the chance to raise a Pokemon through all stages of evolution, and I have a preference for starting with a basic Pokemon. Also, if a Pokemon normally requires a trade to evolve, that’s no longer the case: any Pokemon can evolve in this game without having to trade (as that’s impossible/difficult to do on an emulator as far as I know). Let’s start. Started as a girl, named myself Panda, walked over to Brendan’s house (you remember how much I hate that guy?) well, I forget if I caught this last time but… he says “I heard a gym leader’s kid moved next door, I assumed you’d be a boy.” Stupid boy. Anyways. Let’s move on, I’d rather stick to writing about the experience that is a random starter pick. It’s honestly one of the most exciting things about starting a Nuzlocke. My choices were: A Togepi (nope) a Meowth (okay…) and a Goldeen (yes!). I’m going to skip the nicknaming portion of the Nuzlocke; I never thought nicknames got me any more attached to the Pokemon anyways, so my Goldeen will stay, “Goldeen.” Anyways, Panda and Goldeen saved Prof. Birch from none other than an Octillery; a wild Octopus Pokemon known for kidnapping full grown men off of grassy continental roads… obviously, so that was a close one. The first wild battle Panda and Goldeen face: a Muk. Pretty dangerous, I mean, Goldeen could be poisoned, or Muk could explode: who knows? Goldeen pecks it to death though, and levels up! Sweet. I forgot where to go to heal Pokemon, and wasted time seeing if Prof. Birch had any way to heal Goldeen. Mom always offers a little rest, way to go Pokemon Emerald mom, allowing naps whenever you please! The wild grass right outside of Littleroot Town only has Muks and Crobats. Could you imagine living there? It’d be horrible. Men attacked by Octopi in full daylight? Poisonous bats and globs of toxic waste roaming around 24/7? Littleroot is a nightmare, Oldale town too – unless the Pokemon in the grass north of Oldale are any less dangerous. Just so happens? The grass north of Oldale is full of Spindas. That’s not a horrible deal. So if you live in Oldale, yeah you have to deal with the deathtrap grass in the south, but the grass up north is full of harmless – yet creepy – teddy bear Pokemon basically. First trainer battle: Panda v. Brendan, Goldeen v. Togepi. Well, that’s not much of a fight actually. Poor Togepi just growled until Goldeen’s peck barely did any damage, but still, it was extremely one-sided. Coincidentally, Goldeen and Togepi are Misty’s Pokemon right? How weird and screwed up would it be for her to pit Togepi against Goldeen? What are you thinking Brendan? This isn’t a Pokemon fit for battle! I feel dirty for even agreeing to that battle. Guh! So you know what happens next; a forty-something year old dude allows a bunch of pre-teen children to go out into the world alone to do his research for him, and you’re given Pokeballs to start your adventure. Let’s see if we can catch a Muk, or Crobat – either or would be pretty cool. Whoa, head’s up! There’s a Magnemite in the grass. Using the flying-type move Peck to get it down to low-health takes for-ev-er, but Goldeen hangs in there, and Panda catches her second Pokemon: Magnemite (woo). Route 101: Caught: Magnemite. Onto Route 103; the rule of only catching the first Pokemon you encounter holds, and unfortunately, it’s going to be a Spinda on Route 103, or at least, that seems most probable. Whoa, head’s up! There’s a Pichu in the grass. Okay. I’m really underestimating how many types of Pokemon are hiding in the grass here. The wild Pichu brings Goldeen down to 12 out of 26 HP, which is to say, near-death. Pretty good for a wild lvl.3 Pokemon. Goldeen still manages to get in the necessary hits, and secure the capture of Panda’s second Pokemon, Pichu. Route 103: Caught: Pichu. Panda takes a break at Oldale’s Pokemon center to heal up, reflect on the day’s events, and look forward to the future. Let’s face it, Goldeen is the head of the pack here. The first gym is rock-type, and there’s no way Pichu and Magnemite are going to be in shape for that type of fight. Still, I’m getting ahead of myself. I remember there being a lot of stuff in between Oldale and the first gym: Petalburg? Petaburg? A forest of some sort, and a Devon Corp dude. Team Panda has an endurance run ahead of them, it’s all about keeping Goldeen alive. Neko puts on his running shoes and heads out on Route 101 to catch his first Pokemon, hopefully. He catches a Level 2 Barboach, and names it Nicky. Nicky is a Rock and Steel Type Pokemon, with a Timid Nature and a Shed Skin Ability that gives him a 33% chance of randomly curing Burns or Poisons. He knows the attack Muddy Water. He doesn’t seem like a poor team mate. With some light training, Nicky reaches Level 6 and learns Iron Tail, and Thundershock. Dude, what? Nicky seems pretty freaking awesome, actually. Neko’s second acquisition of the day is Osiris, a Level 2 Magmar he captured on Route 103. Osiris is a Dark Type Pokemon, with an ability that makes him impervious to paralyze, a Sassy Nature, and he knows four moves already. Hidden Power, Teeter Dance, Thundershock, and Super Fang. On top of all of this, Osiris was holding a Great Ball, so Neko gets a head start on the advanced inventory items. Neko and I force Osiris to Level 6 by making him kill Onixes over and over again, but he doesn’t learn anything. Still, I have a soft spot for Magmar’s since Kingsford – and even if this isn’t a Fire-Type Magmar, I have a good feeling about Osiris. Neko’s third catch of the day is Chu, a Level 4 Chinchou captured on Route 102. Chu is a Flying Type Pokemon, with Marvel Scale ability, a Gentle Nature, and knowledge of the Façade and Mean Look attacks. Neko’s first opponent on Route 102 is Rattata Rank Calvin, who has a grossly green Houndoom, and then his second opponent is Rye Catcher Rick who owns a bright pink Cloyster, and a bright red Gorebyss. I have to stop and think for a second about how bizarre the trainer randomizations are. In Petalburg, Neko’s father makes him take some kid named Wally into the tall grass to catch a Pokemon. Neko’s father gives him a Bayleef of all things, to help in this errand. Talk about downgrading! Here’s a Bayleef, now, go use it to catch one hell of a Rattata. In practice though, Wally gets a major upgrade, as he catches one badass Oddish that nearly killed his Bayleef. Wally and Neko return to the Petalburg Gym, where Neko’s father is furious that Wally almost got the Pokemon lent to him killed. On Route 104, Neko runs into the coolest looking Skarmory anyone’s ever seen before. The monster is a bright purple and blue, flying steel death machine that reminds him of when he used to play Halo 2. As such, when this monstrosity is tamed and captured, Neko names it Banshee. Banshee is a Psychic and Water Type Pokemon, with an ability that raises Attack, and knowledge of Swift, and Beat Up. For as cool as Banshee looks, he’s kind of underwhelming. Neko is out of Pokeballs and has to spend some of his fight money to replenish his stock. Capturing four Pokemon in one day and only wasting six Pokeballs isn’t at all bad, Neko figures. After fighting some trainers on Petalburg’s beaches, Nikita reaches Level 11 and learns Flatter, which is an alright move. Despite the weird makeup of the team, and the potentially interesting future of this squad, Neko finds himself somewhat bored here in Petalburg. He’s almost acquired a full team of six, but he’s unfamiliar with most of them. On the shores of this small town, Neko wonders what the hell any of this is about, and why he couldn’t have lived a quieter life.